Life is better covered in glitter – it’s also better stink-free! Poo~Pourri No. 2 is a pure blend of peach and mixed berry natural essential oils that eliminates bathroom odor before it begins by creating a barrier on the water’s surface. Guess diamonds are a girl’s second-best friend. Some say the secret to a happy relationship is separate bathrooms, but those people have never tried Poo~Pourri, the classy, sassy, ultra effective way to leave the bathroom smelling better than you found it. Our award winning before-you-go toilet sprays come in several different sizes and scents. Go ahead…join thousands of happy customers who’ve tried Poo~Pourri for fun and keep using it because it really works! When you spray Poo~Pourri into the bowl before-you-go, our proprietary formula creates a protective barrier on the water’s surface. This barrier is designed to trap unpleasant bathroom odors beneath the surface and keep them out of the air. All you’ll smell is a refreshing bouquet of essential oils! 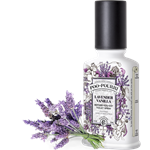 With a bottle of Poo~Pourri in your handbag, what you do in the bathroom is nobody’s business but yours! 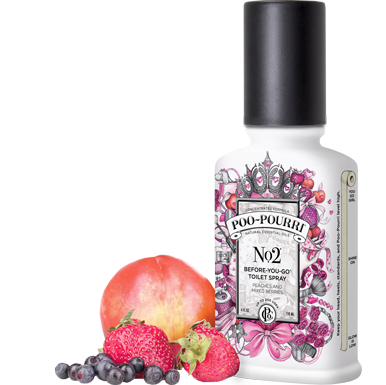 Poo~Pourri’s aromatherapy magic replaces embarrassment with confidence in any bathroom situation. There’ll be no aerosol cover-up for you! You (and everyone around you) can breathe easy with Poo~Pourri. 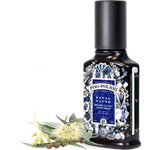 Poo~Pourri does more than just improve air quality – it’s environmentally friendly. Our secret blends rely on essential oils to eliminate bathroom odors, making it safe for the planet and your septic systems. The 2 ounce bottle of Poo Pourri equals approximately 100 uses. A Fresh Blend of Mountain Air. Spritz Before You Drop A Line Prevent Bass Odor Everytime. The ORIGINAL Before-You-Go Toilet Spray that stops bathroom odors before they ever begin - seriously! No more trying to mask odor already in the air. A Warm Fresh Blend of Lavender and Vanilla. Spritz the Bowl Before-You-Go and No One Else Will Ever Know! The ORIGINAL Before-You-Go Toilet Spray that stops bathroom odors before they ever begin - seriously! No more trying to mask odor already in the air. An Elegant Fresh Blend of Peony, Rose and Citrus. Embarrassing Odors... Say Adieu! The ORIGINAL Before-You-Go Toilet Spray that stops bathroom odors before they ever begin - seriously!! A Fresh Masculine Blend of Eucalyptus and Spearmint. Great Washroom Scent for Distinguished Gents! The ORIGINAL Before-You-Go Toilet Spray that stops bathroom odors before they ever begin - seriously! No more trying to mask odor already in the air. A Deep and Spicy Blend of Blood Orange. Never Leave a Trail, an Odor Trapper for Any Crapper. The ORIGINAL Before-You-Go Toilet Spray that stops bathroom odors before they ever begin - seriously! No more trying to mask odor already in the air.